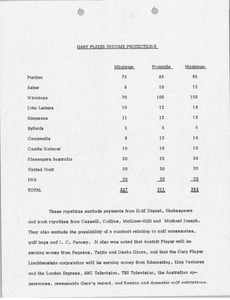 Projecting the minimum, probable, and maximum amount of royalty income for Gary Player. 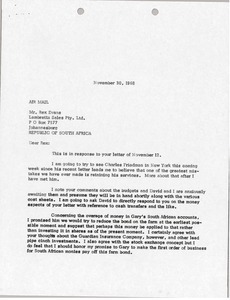 Concerning management fees from Gary Player Enterprises and Gary Player Promotions during tax year 1968. 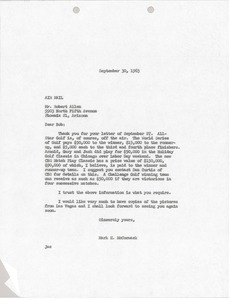 McCormack Lists the amount of money professional golfers make for certain tournaments, including the World Series of Golf and the Holiday Golf Classic in Chicago. 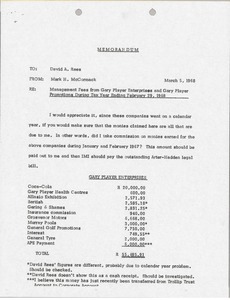 He suggests contacting Dan Curtis of CBS for details on the amount of money the CBS Match Play Classic pays out. See also mums700-b0001-f016-i033. 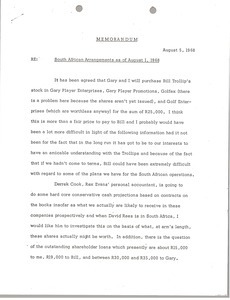 Cleveland - Memorandum from Mark H. McCormack regarding South African affairs including the arrangement between the Trollips and Gary Player, Gary Player Enterprises, the horse project, the Rex Evans arrangement, all contracts and Bill Trollip. 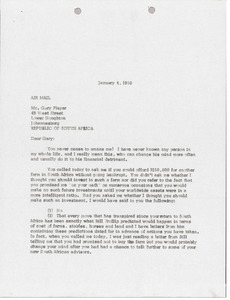 Informing Rees of two Gary Player checks to enter into accounts. One for the Australian Open and one for the Wills. 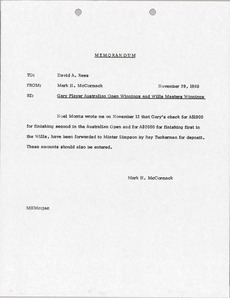 Both have been forwarded to Minter Simpson by Ray Tuckerman. 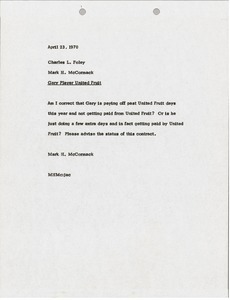 McCormack writes Charles L. Foley inquiring about the status of the contract between Gary Player and United Fruit. 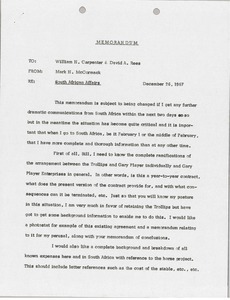 Cleveland (Ohio) - McCormack comments on Gary Player's financial and investment choices, warns him of the consequences of his choices and criticizes his decisions. 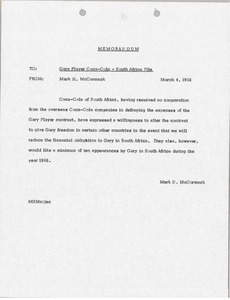 Coca-Cola of South Africa expressed a willingness to alter the Gary Player contract to give him freedom in other countries in the event that they will reduce the financial obligations to Gary in South Africa.